Obama: Canadian health care model won't work in U.S. 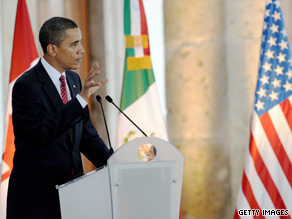 Speaking in Mexico Monday, President Obama said a Canadian model for health care won't work in the United States. GUADALAJRA, Mexico (CNN) - President Barack Obama said Monday that Canada's government-run health care model won't work in the United States. "We've got to develop a uniquely American approach to this problem," Obama said at the final news conference of his North American summit with Canadian Prime Minister Stephen Harper and Mexican President Felipe Calderon. Opponents of health-care legislation in the U.S. House and Senate say it will lead to a single-payer system like the government-run program in Canada, with some warning the Canadian system means restrictions on treatments and long delays. Obama noted the U.S. system is based on employers providing health insurance for most Americans. Throwing that out would be too radical an overhaul, he said. "The Canadian model won't work in the United States," he said. However, he said he expects opponents of health-care legislation to continue to make what he called the misleading comparison between proposed U.S. legislation and Canada's system. "I suspect that you Canadians are going to continue to get dragged into the debate," he said. The Canadian system won't work in the US because Americans can't stand anything not American. Only American things are up to their standard. The idea of adopting anything from any other country inevitably stirs up this mindless nonsense. Our system isn't great. But I know that I will be covered no matter what. I don't' have to work two jobs just to afford a monthly insurance payment. There aren't millions of people in our country who have to forgo basic care because of money. Canadians are willing to help our neighbours out, though Americans only want their tax dollars to cover services for themselves. They are scared stiff that some "undeserving" poor person might benefit from their hard-earned money. I am very happy with the Canadian Health care system. Sure we have to wait sometimes because of a shortage of Doctors, that is because many Doctors move to the USA where they can charge more. If there is a Government controlled medical system in the USA then that may be beneficial to us Canadians! I cannot imagine what it will be like to be sick and to have to worry that I cannot afford to see a Doctor! There many ways to restructure our healthcare system. It does need overhaul. I support Pres Obama. I think a medicare-like system would work. My firm belief is that EVERYONE needs to pay into the health "insurance" even if it is a tax, like the medicare tax. Companies need to stop making money by denying coverage for preexisting/current health problems. Their salaries are way too high. I totally disagree with people who want to preserve the status quo. Anyone who cannot get coverage will not want to maintain it. My concern is that our representatives will be voting before the proposals are totally laid out. For proposals this big, it seems that trying to get this through quickly will lead to more problems. I want my elected officials to 1) know how much this will cost (per person, per year) 2) EXACTLY what will be covered 3) How much will my taxes go up 4) what provisions are allowed for illegal immigrants AND ALSO there can be no reform in health care without tort reform. If the government is asking doctors to order less tests or reduce their costs, then there has to be some assurance they will not be sued because of it. Malpractice insurance has gotten out of hand for doctors here in the US. Other countries don't have the same "SUE EM" mentality. The Canadian model doesn't even work for the Canadians. The truth is that anything our government runs does not work well or efficiently. The best thing they ever did was the post office and it is broke, closing shops and considering stopping Saturday service. I would not be as cynical if our government would use the health care program they are proposing. Why are they not going to use it? Why do we, their boss, have to use it, and they don't? Most of these congress people have not even read the bill. They say we have to get it done now!! This was the same thing that happened with TARP. They didn't read that. And money was wasted. What about the Stimulus bill. They hurried that through and money is wasted and not being spent the way they said it would be. Why is this different? The answer is that its not.